Chapter 7B - Juvenile Code. Article 1 - Purposes; Definitions. § 7B-201. Retention and termination of jurisdiction. § 7B-203. Reserved for future codification purposes. § 7B-204. Reserved for future codification purposes. § 7B-205. Reserved for future codification purposes. § 7B-206. Reserved for future codification purposes. § 7B-207. Reserved for future codification purposes. § 7B-208. Reserved for future codification purposes. § 7B-209. Reserved for future codification purposes. § 7B-210. Reserved for future codification purposes. § 7B-211. Reserved for future codification purposes. § 7B-212. Reserved for future codification purposes. § 7B-213. Reserved for future codification purposes. § 7B-214. Reserved for future codification purposes. § 7B-215. Reserved for future codification purposes. § 7B-216. Reserved for future codification purposes. § 7B-217. Reserved for future codification purposes. § 7B-218. Reserved for future codification purposes. § 7B-219. Reserved for future codification purposes. § 7B-220. Reserved for future codification purposes. § 7B-221. Reserved for future codification purposes. § 7B-222. Reserved for future codification purposes. § 7B-223. Reserved for future codification purposes. § 7B-224. Reserved for future codification purposes. § 7B-225. Reserved for future codification purposes. § 7B-226. Reserved for future codification purposes. § 7B-227. Reserved for future codification purposes. § 7B-228. Reserved for future codification purposes. § 7B-229. Reserved for future codification purposes. § 7B-230. Reserved for future codification purposes. § 7B-231. Reserved for future codification purposes. § 7B-232. Reserved for future codification purposes. § 7B-233. Reserved for future codification purposes. § 7B-234. Reserved for future codification purposes. § 7B-235. Reserved for future codification purposes. § 7B-236. Reserved for future codification purposes. § 7B-237. Reserved for future codification purposes. § 7B-238. Reserved for future codification purposes. § 7B-239. Reserved for future codification purposes. § 7B-240. Reserved for future codification purposes. § 7B-241. Reserved for future codification purposes. § 7B-242. Reserved for future codification purposes. § 7B-243. Reserved for future codification purposes. § 7B-244. Reserved for future codification purposes. § 7B-245. Reserved for future codification purposes. § 7B-246. Reserved for future codification purposes. § 7B-247. Reserved for future codification purposes. § 7B-248. Reserved for future codification purposes. § 7B-249. Reserved for future codification purposes. § 7B-250. Reserved for future codification purposes. § 7B-251. Reserved for future codification purposes. § 7B-252. Reserved for future codification purposes. § 7B-253. Reserved for future codification purposes. § 7B-254. Reserved for future codification purposes. § 7B-255. Reserved for future codification purposes. § 7B-256. Reserved for future codification purposes. § 7B-257. Reserved for future codification purposes. § 7B-258. Reserved for future codification purposes. § 7B-259. Reserved for future codification purposes. § 7B-260. Reserved for future codification purposes. § 7B-261. Reserved for future codification purposes. § 7B-262. Reserved for future codification purposes. § 7B-263. Reserved for future codification purposes. § 7B-264. Reserved for future codification purposes. § 7B-265. Reserved for future codification purposes. § 7B-266. Reserved for future codification purposes. § 7B-267. Reserved for future codification purposes. § 7B-268. Reserved for future codification purposes. § 7B-269. Reserved for future codification purposes. § 7B-270. Reserved for future codification purposes. § 7B-271. Reserved for future codification purposes. § 7B-272. Reserved for future codification purposes. § 7B-273. Reserved for future codification purposes. § 7B-274. Reserved for future codification purposes. § 7B-275. Reserved for future codification purposes. § 7B-276. Reserved for future codification purposes. § 7B-277. Reserved for future codification purposes. § 7B-278. Reserved for future codification purposes. § 7B-279. Reserved for future codification purposes. § 7B-280. Reserved for future codification purposes. § 7B-281. Reserved for future codification purposes. § 7B-282. Reserved for future codification purposes. § 7B-283. Reserved for future codification purposes. § 7B-284. Reserved for future codification purposes. § 7B-285. Reserved for future codification purposes. § 7B-286. Reserved for future codification purposes. § 7B-287. Reserved for future codification purposes. § 7B-288. Reserved for future codification purposes. § 7B-289. Reserved for future codification purposes. § 7B-290. Reserved for future codification purposes. § 7B-291. Reserved for future codification purposes. § 7B-292. Reserved for future codification purposes. § 7B-293. Reserved for future codification purposes. § 7B-294. Reserved for future codification purposes. § 7B-295. Reserved for future codification purposes. § 7B-296. Reserved for future codification purposes. § 7B-297. Reserved for future codification purposes. § 7B-298. Reserved for future codification purposes. § 7B-299. Reserved for future codification purposes. Article 3 - Screening of Abuse and Neglect Complaints. § 7B-301. Duty to report abuse, neglect, dependency, or death due to maltreatment. § 7B-302. Assessment by director; access to confidential information; notification of person making the report. § 7B-303. Interference with assessment. § 7B-304: Repealed by Session Laws 2003, c. 140, s. 1, effective June 4, 2003. § 7B-305. Request for review by prosecutor. § 7B-306. Review by prosecutor. § 7B-307. Duty of director to report evidence of abuse, neglect; investigation by local law enforcement; notification of Department of Health and Human Services. § 7B-308. Authority of medical professionals in abuse cases. § 7B-309. Immunity of persons reporting and cooperating in an assessment. § 7B-310. Privileges not grounds for failing to report or for excluding evidence. § 7B-311. Central registry; responsible individuals list. § 7B-312: Reserved for future codification purposes. § 7B-313: Reserved for future codification purposes. § 7B-314: Reserved for future codification purposes. § 7B-315: Reserved for future codification purposes. § 7B-316: Reserved for future codification purposes. § 7B-317: Reserved for future codification purposes. § 7B-318: Reserved for future codification purposes. § 7B-319: Reserved for future codification purposes. Article 3A - Judicial Review; Responsible Individuals List. § 7B-320. Notification to individual determined to be a responsible individual. § 7B-321: Repealed by Session Laws 2010-90, s. 6, effective July 11, 2010. § 7B-322: Repealed by Session Laws 2010-90, s. 6, effective July 11, 2010. § 7B-323. Petition for judicial review; district court. § 7B-324. Persons ineligible to petition for judicial review. § 7B-325: Reserved for future codification purposes. § 7B-326: Reserved for future codification purposes. § 7B-327: Reserved for future codification purposes. § 7B-328: Reserved for future codification purposes. § 7B-329: Reserved for future codification purposes. § 7B-330: Reserved for future codification purposes. § 7B-331: Reserved for future codification purposes. § 7B-332: Reserved for future codification purposes. § 7B-333: Reserved for future codification purposes. § 7B-334: Reserved for future codification purposes. § 7B-335: Reserved for future codification purposes. § 7B-336: Reserved for future codification purposes. § 7B-337: Reserved for future codification purposes. § 7B-338: Reserved for future codification purposes. § 7B-339: Reserved for future codification purposes. § 7B-340: Reserved for future codification purposes. § 7B-341: Reserved for future codification purposes. § 7B-342: Reserved for future codification purposes. § 7B-343: Reserved for future codification purposes. § 7B-344: Reserved for future codification purposes. § 7B-345: Reserved for future codification purposes. § 7B-346: Reserved for future codification purposes. § 7B-347: Reserved for future codification purposes. § 7B-348: Reserved for future codification purposes. § 7B-349: Reserved for future codification purposes. § 7B-350: Reserved for future codification purposes. § 7B-351: Reserved for future codification purposes. § 7B-352: Reserved for future codification purposes. § 7B-353: Reserved for future codification purposes. § 7B-354: Reserved for future codification purposes. § 7B-355: Reserved for future codification purposes. § 7B-356: Reserved for future codification purposes. § 7B-357: Reserved for future codification purposes. § 7B-358: Reserved for future codification purposes. § 7B-359: Reserved for future codification purposes. § 7B-360: Reserved for future codification purposes. § 7B-361: Reserved for future codification purposes. § 7B-362: Reserved for future codification purposes. § 7B-363: Reserved for future codification purposes. § 7B-364: Reserved for future codification purposes. § 7B-365: Reserved for future codification purposes. § 7B-366: Reserved for future codification purposes. § 7B-367: Reserved for future codification purposes. § 7B-368: Reserved for future codification purposes. § 7B-369: Reserved for future codification purposes. § 7B-370: Reserved for future codification purposes. § 7B-371: Reserved for future codification purposes. § 7B-372: Reserved for future codification purposes. § 7B-373: Reserved for future codification purposes. § 7B-374: Reserved for future codification purposes. § 7B-375: Reserved for future codification purposes. § 7B-376: Reserved for future codification purposes. § 7B-377: Reserved for future codification purposes. § 7B-378: Reserved for future codification purposes. § 7B-379: Reserved for future codification purposes. § 7B-380: Reserved for future codification purposes. § 7B-381: Reserved for future codification purposes. § 7B-382: Reserved for future codification purposes. § 7B-383: Reserved for future codification purposes. § 7B-384: Reserved for future codification purposes. § 7B-385: Reserved for future codification purposes. § 7B-386: Reserved for future codification purposes. § 7B-387: Reserved for future codification purposes. § 7B-388: Reserved for future codification purposes. § 7B-389: Reserved for future codification purposes. § 7B-390: Reserved for future codification purposes. § 7B-391: Reserved for future codification purposes. § 7B-392: Reserved for future codification purposes. § 7B-393: Reserved for future codification purposes. § 7B-394: Reserved for future codification purposes. § 7B-395: Reserved for future codification purposes. § 7B-396: Reserved for future codification purposes. § 7B-397: Reserved for future codification purposes. § 7B-398: Reserved for future codification purposes. § 7B-399: Reserved for future codification purposes. Article 4 - Venue; Petitions. § 7B-401. Pleading and process. § 7B-403. Receipt of reports; filing of petition. § 7B-404. Immediate need for petition when clerk's office is closed. § 7B-405. Commencement of action. § 7B-406. Issuance of summons. § 7B-407. Service of summons. § 7B-408. Copy of petition and notices to guardian ad litem. § 7B-409: Reserved for future codification purposes. § 7B-410: Reserved for future codification purposes. § 7B-411: Reserved for future codification purposes. § 7B-412: Reserved for future codification purposes. § 7B-413: Reserved for future codification purposes. Article 5 - Temporary Custody; Nonsecure Custody; Custody Hearings. § 7B-500. Taking a juvenile into temporary custody; civil and criminal immunity. § 7B-501. Duties of person taking juvenile into temporary custody. § 7B-502. Authority to issue custody orders; delegation. § 7B-503. Criteria for nonsecure custody. § 7B-504. Order for nonsecure custody. § 7B-505. Placement while in nonsecure custody. § 7B-505.1. Consent for medical care for a juvenile placed in nonsecure custody of a department of social services. § 7B-506. Hearing to determine need for continued nonsecure custody. § 7B-507. Juvenile placed in nonsecure custody of a department of social services. § 7B-508. Telephonic communication authorized. Article 6 - Basic Rights. § 7B-601. Appointment and duties of guardian ad litem. § 7B-602. Parent's right to counsel; guardian ad litem. § 7B-603. Payment of court-appointed attorney or guardian ad litem. § 7B-700. Sharing of information; discovery. Article 8 - Hearing Procedures. § 7B-800. Amendment of petition. § 7B-802. Conduct of hearing. § 7B-804. Rules of evidence. § 7B-805. Quantum of proof in adjudicatory hearing. § 7B-806. Record of proceedings. § 7B-900.1. Post adjudication venue. § 7B-901. Initial dispositional hearing. § 7B-902: Repealed by Session Laws 2011-295, s. 8, effective October 1, 2011, and applicable to actions filed on or pending on or after that date. § 7B-903. Dispositional alternatives for abused, neglected, or dependent juvenile. § 7B-903.1. Juvenile placed in custody of a department of social services. § 7B-904. Authority over parents of juvenile adjudicated as abused, neglected, or dependent. § 7B-906: Repealed by Session Laws 2013-129, s. 25, effective October 1, 2013, and applicable to actions filed or pending on or after that date. § 7B-906.1. Review and permanency planning hearings. § 7B-906.2. Permanent plans; concurrent planning. § 7B-907: Repealed by Session Laws 2013-129, s. 25, effective October 1, 2013, and applicable to actions filed or pending on or after that date. § 7B-908. Post termination of parental rights' placement court review. § 7B-909. Review of agency's plan for placement. § 7B-910. Review of voluntary foster care placements. § 7B-910.1. Review of voluntary foster care placements with young adults. § 7B-911. Civil child custody order. § 7B-912. Juveniles 14 years of age and older; Another Planned Permanent Living Arrangement. Article 10 - Modification and Enforcement of Dispositional Orders; Appeals. § 7B-1000. Authority to modify or vacate. § 7B-1001. Right to appeal. § 7B-1002. Proper parties for appeal. § 7B-1003. Disposition pending appeal. § 7B-1004. Disposition after appeal. Article 11 - Termination of Parental Rights. § 7B-1100. Legislative intent; construction of Article. § 7B-1101.1. Parent's right to counsel; guardian ad litem. § 7B-1102. Pending child abuse, neglect, or dependency proceedings. § 7B-1103. Who may file a petition or motion. § 7B-1104. Petition or motion. § 7B-1105. Preliminary hearing; unknown parent. § 7B-1106. Issuance of summons. § 7B-1106.1. Notice in pending child abuse, neglect, or dependency cases. § 7B-1107. Failure of parent to answer or respond. § 7B-1108. Answer or response of parent; appointment of guardian ad litem for juvenile. § 7B-1109. Adjudicatory hearing on termination. § 7B-1110. Determination of best interests of the juvenile. § 7B-1112. Effects of termination order. § 7B-1112.1. Selection of adoptive parents. § 7B-1113: Repealed by Session Laws 2005-398, s. 18, effective October 1, 2005. § 7B-1114. Reinstatement of parental rights. Article 12 - Guardian ad Litem Program. § 7B-1200. Office of Guardian ad Litem Services established. § 7B-1201. Implementation and administration. § 7B-1202. Conflict of interest or impracticality of implementation. § 7B-1204. Civil liability of volunteers. Article 13 - Prevention of Abuse and Neglect. § 7B-1301. Program on Prevention of Abuse and Neglect. § 7B-1302. Children's Trust Fund.  Article 14 - North Carolina Child Fatality Prevention System. § 7B-1400. Declaration of public policy. § 7B-1402. Task Force – creation; membership; vacancies. § 7B-1403. Task Force – duties. § 7B-1404. State Team – creation; membership; vacancies. § 7B-1405. State Team – duties. § 7B-1406. Community Child Protection Teams; Child Fatality Prevention Teams; creation and duties. § 7B-1408. Child Fatality Prevention Team Coordinator; duties. § 7B-1409. Community Child Protection Teams; duties of the director of the county department of social services. § 7B-1410. Local Teams; duties of the director of the local department of health. § 7B-1411. Community Child Protection Teams; responsibility for training of team members. § 7B-1412. Task Force – reports. § 7B-1413. Access to records. Article 15 - Purposes; Definitions. § 7B-1600. Jurisdiction over undisciplined juveniles. § 7B-1601. (Effective until December 1, 2019) Jurisdiction over delinquent juveniles. § 7B-1602. Extended jurisdiction over a delinquent juvenile under certain circumstances. § 7B-1603. Jurisdiction in certain circumstances. § 7B-1604. (Effective until December 1, 2019) Limitations on juvenile court jurisdiction. Article 17 - Screening of Delinquency and Undisciplined Complaints. § 7B-1700.1. Duty to report abuse, neglect, dependency. § 7B-1702. (Effective until December 1, 2019) Evaluation. § 7B-1704. Request for review by prosecutor. § 7B-1705. Review of determination that petition should not be filed. § 7B-1706. Diversion plans and referral. § 7B-1707. Direct contempt by juvenile. Article 18 - Venue; Petition; Summons. § 7B-1801. Pleading and process. § 7B-1803. Receipt of complaints; filing of petition. § 7B-1804. Commencement of action. § 7B-1805. Issuance of summons. § 7B-1806. Service of summons. § 7B-1807. Notice to parent and juvenile of scheduled hearings. § 7B-1808. First appearance for felony cases. Article 19 - Temporary Custody; Secure and Nonsecure Custody; Custody Hearings. § 7B-1900. Taking a juvenile into temporary custody. § 7B-1901. Duties of person taking juvenile into temporary custody. § 7B-1902. Authority to issue custody orders; delegation. § 7B-1903. Criteria for secure or nonsecure custody. § 7B-1904. Order for secure or nonsecure custody. § 7B-1905. Place of secure or nonsecure custody. § 7B-1906. Secure or nonsecure custody hearings. § 7B-1907. Telephonic communication authorized. Article 20 - Basic Rights. § 7B-2000. Juvenile's right to counsel; presumption of indigence. § 7B-2001. Appointment of guardian. § 7B-2002. Payment of court-appointed attorney. Article 21 - Law Enforcement Procedures in Delinquency Proceedings. § 7B-2100. Role of the law enforcement officer. § 7B-2102. Fingerprinting and photographing juveniles. § 7B-2103. Authority to issue nontestimonial identification order where juvenile alleged to be delinquent. § 7B-2104. Time of application for nontestimonial identification order. § 7B-2105. Grounds for nontestimonial identification order. § 7B-2106. Issuance of order. § 7B-2107. Nontestimonial identification order at request of juvenile. § 7B-2108. Destruction of records resulting from nontestimonial identification procedures. § 7B-2109. Penalty for willful violation. Article 22 - Probable Cause Hearing and Transfer Hearing. § 7B-2200. (Effective until December 1, 2019) Transfer of jurisdiction of juvenile to superior court. § 7B-2200.1: Reserved for future codification purposes. § 7B-2200.2: Reserved for future codification purposes. § 7B-2200.3: Reserved for future codification purposes. § 7B-2200.4: Reserved for future codification purposes. § 7B-2200.5. (Effective December 1, 2019) Transfer of jurisdiction of a juvenile at least 16 years of age to superior court. § 7B-2201. Fingerprinting and DNA sample from juvenile transferred to superior court. § 7B-2202. Probable cause hearing. § 7B-2204. Right to pretrial release; detention. § 7B-2300. Disclosure of evidence by petitioner. § 7B-2301. Disclosure of evidence by juvenile. § 7B-2302. Regulation of discovery; protective orders. § 7B-2303. Continuing duty to disclose. Article 24 - Hearing Procedures. § 7B-2400. Amendment of petition. § 7B-2401. Determination of incapacity to proceed; evidence; temporary commitment; temporary orders. § 7B-2402.1. Restraint of juveniles in courtroom. § 7B-2404. Participation of the prosecutor; voluntary dismissal. § 7B-2405. Conduct of the adjudicatory hearing. § 7B-2407. When admissions by juvenile may be accepted. § 7B-2408. Rules of evidence. § 7B-2408.1: Reserved for future codification purposes. § 7B-2408.2: Reserved for future codification purposes. § 7B-2408.3: Reserved for future codification purposes. § 7B-2408.4: Reserved for future codification purposes. § 7B-2408.5. Motion to suppress evidence in adjudicatory hearings; procedure; appeal. § 7B-2409. Quantum of proof in adjudicatory hearing. § 7B-2410. Record of proceedings. § 7B-2412. Legal effect of adjudication of delinquency. § 7B-2414. When jeopardy attaches. § 7B-2502. Evaluation and treatment of undisciplined and delinquent juveniles. § 7B-2503. Dispositional alternatives for undisciplined juveniles. § 7B-2504. Conditions of protective supervision for undisciplined juveniles. § 7B-2505. Violation of protective supervision by undisciplined juvenile. § 7B-2506. Dispositional alternatives for delinquent juveniles. § 7B-2507. (Effective until December 1, 2019) Delinquency history levels. § 7B-2508. Dispositional limits for each class of offense and delinquency history level. § 7B-2508.1. (Effective December 1, 2019) Criminal gang activity. § 7B-2509. Registration of certain delinquent juveniles. § 7B-2510. Conditions of probation; violation of probation. § 7B-2511. Termination of probation. § 7B-2513. Commitment of delinquent juvenile to Division. § 7B-2514. Post-release supervision planning; release. § 7B-2515. (Effective until December 1, 2019) Notification of extended commitment; plan of treatment. § 7B-2516. Revocation of post-release supervision. § 7B-2517. Transfer authority of Governor. Article 26 - Modification and Enforcement of Dispositional Orders; Appeals. § 7B-2600. Authority to modify or vacate. § 7B-2601. Request for modification for lack of suitable services. § 7B-2602. Right to appeal. § 7B-2603. Right to appeal transfer decision. § 7B-2604. Proper parties for appeal. § 7B-2605. Disposition pending appeal. § 7B-2606. Disposition after appeal. Article 27 - Authority over Parents of Juveniles Adjudicated Delinquent or Undisciplined. § 7B-2700. Appearance in court. § 7B-2701. Parental responsibility classes. § 7B-2702. Medical, surgical, psychiatric, or psychological evaluation or treatment of juvenile or parent. § 7B-2703. Compliance with orders of court. § 7B-2704. Payment of support or other expenses; assignment of insurance coverage. § 7B-2705. Employment discrimination unlawful. § 7B-2706. Contempt for failure to comply. Article 28 - Interstate Compact on Juveniles. §§ 7B-2800 through 7B-2827: Repealed by Session Laws 2005-194, s. 2. See editor's note. § 7B-2828: Reserved for future codification purposes. § 7B-2829: Reserved for future codification purposes. § 7B-2830: Reserved for future codification purposes. § 7B-2831: Reserved for future codification purposes. § 7B-2832: Reserved for future codification purposes. § 7B-2833: Reserved for future codification purposes. § 7B-2834: Reserved for future codification purposes. § 7B-2835: Reserved for future codification purposes. § 7B-2836: Reserved for future codification purposes. § 7B-2837: Reserved for future codification purposes. § 7B-2838: Reserved for future codification purposes. § 7B-2839: Reserved for future codification purposes. § 7B-2840: Reserved for future codification purposes. § 7B-2841: Reserved for future codification purposes. § 7B-2842: Reserved for future codification purposes. § 7B-2843: Reserved for future codification purposes. § 7B-2844: Reserved for future codification purposes. § 7B-2845: Reserved for future codification purposes. § 7B-2846: Reserved for future codification purposes. § 7B-2847: Reserved for future codification purposes. § 7B-2848: Reserved for future codification purposes. § 7B-2849: Reserved for future codification purposes. § 7B-2850: Reserved for future codification purposes. § 7B-2851: Reserved for future codification purposes. § 7B-2852: Reserved for future codification purposes. § 7B-2853: Reserved for future codification purposes. § 7B-2854: Reserved for future codification purposes. § 7B-2855: Reserved for future codification purposes. § 7B-2856: Reserved for future codification purposes. § 7B-2857: Reserved for future codification purposes. § 7B-2858: Reserved for future codification purposes. § 7B-2859: Reserved for future codification purposes. § 7B-2860: Reserved for future codification purposes. § 7B-2861: Reserved for future codification purposes. § 7B-2862: Reserved for future codification purposes. § 7B-2863: Reserved for future codification purposes. § 7B-2864: Reserved for future codification purposes. § 7B-2865: Reserved for future codification purposes. § 7B-2866: Reserved for future codification purposes. § 7B-2867: Reserved for future codification purposes. § 7B-2868: Reserved for future codification purposes. § 7B-2869: Reserved for future codification purposes. § 7B-2870: Reserved for future codification purposes. § 7B-2871: Reserved for future codification purposes. § 7B-2872: Reserved for future codification purposes. § 7B-2873: Reserved for future codification purposes. § 7B-2874: Reserved for future codification purposes. § 7B-2875: Reserved for future codification purposes. § 7B-2876: Reserved for future codification purposes. § 7B-2877: Reserved for future codification purposes. § 7B-2878: Reserved for future codification purposes. § 7B-2879: Reserved for future codification purposes. § 7B-2880: Reserved for future codification purposes. § 7B-2881: Reserved for future codification purposes. § 7B-2882: Reserved for future codification purposes. § 7B-2883: Reserved for future codification purposes. § 7B-2884: Reserved for future codification purposes. § 7B-2885: Reserved for future codification purposes. § 7B-2886: Reserved for future codification purposes. § 7B-2887: Reserved for future codification purposes. § 7B-2888: Reserved for future codification purposes. § 7B-2889: Reserved for future codification purposes. § 7B-2890: Reserved for future codification purposes. § 7B-2891: Reserved for future codification purposes. § 7B-2892: Reserved for future codification purposes. § 7B-2893: Reserved for future codification purposes. § 7B-2894: Reserved for future codification purposes. § 7B-2895: Reserved for future codification purposes. § 7B-2896: Reserved for future codification purposes. § 7B-2897: Reserved for future codification purposes. § 7B-2898: Reserved for future codification purposes. § 7B-2899: Reserved for future codification purposes. Article 29 - Records and Social Reports of Cases of Abuse, Neglect, and Dependency. § 7B-2901. Confidentiality of records. § 7B-2902. Disclosure in child fatality or near fatality cases. Article 30 - Juvenile Records and Social Reports of Delinquency and Undisciplined Cases. § 7B-3000. Juvenile court records. § 7B-3001. Other records relating to juveniles. Article 31 - Disclosure of Juvenile Information. § 7B-3100. Disclosure of information about juveniles. § 7B-3101. Notification of schools when juveniles are alleged or found to be delinquent. § 7B-3102. Disclosure of information about juveniles who escape. Article 32 - Expunction of Juvenile Records. § 7B-3200. Expunction of records of juveniles alleged or adjudicated delinquent and undisciplined. § 7B-3201. Effect of expunction. § 7B-3202. Notice of expunction. Article 33 - Computation of Recidivism Rates. § 7B-3300: Repealed by Session Laws 2005-276, s. 14.19(c), effective July 1, 2005. Article 34 - Parental Authority over Juveniles. § 7B-3400. Juvenile under 18 subject to parents' control. § 7B-3403. No criminal liability created. § 7B-3500. Who may petition. § 7B-3504. Considerations for emancipation. § 7B-3505. Final decree of emancipation. § 7B-3506. Costs of court. § 7B-3507. Legal effect of final decree. § 7B-3509. Application of common law. Article 36 - Judicial Consent for Emergency Surgical or Medical Treatment. § 7B-3600. Judicial authorization of emergency treatment; procedure. Article 37 - Placing or Adoption of Juvenile Delinquents or Dependents. § 7B-3700. Consent required for bringing child into State for placement or adoption. § 7B-3702. Consent required for removing child from State. § 7B-3703. Violation of Article a misdemeanor. § 7B-3705. Application of Article. Article 38 - Interstate Compact on the Placement of Children. § 7B-3800. Adoption of Compact. § 7B-3801. Financial responsibility under Compact. § 7B-3802. Agreements under Compact. § 7B-3803. Visitation, inspection or supervision. § 7B-3804. Compact to govern between party states. § 7B-3805. Placement of delinquents. Article 39 - Interstate Compact on Adoption and Medical Assistance. § 7B-3900. Legislative findings and purposes. § 7B-3903. Content of compacts. Article 40 - Interstate Compact for Juveniles. § 7B-4000. (For effective date - see note) Short title. § 7B-4001. (For effective date - see note) Governor to execute Compact; form of Compact. § 7B-4002. Implementation of the Compact.